Precision Robotic Orthopedics (San Francisco) - Book Appointment Online! John Velyvis, MD, is a board certified orthopedic surgeon who focuses on preservation and restoration of the knee and hip. 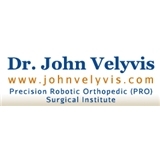 Dr. Velyvis specializes in robotic assisted knee and hip surgery. He performs partial knee, total knee and total hip replacement and arthroscopic knee surgery. Dr. Velyvis completed his fellowship at the Massachusetts General Hospital/Harvard Medical School - focusing on the latest techniques in knee and hip replacement, including minimally invasive surgery and computer-assisted surgery. Dr. Velyvis has lectured and published extensively within the field of orthopedics. He helped pioneer a minimally invasive hip replacement surgical technique, and has extensive experience with the Blue Belt Smith & Nephew robotic knee resurfacing technique, with over 600 surgeries performed. Website: www.johnvelyvismd.com Offices in San Francisco and Daly City. Great consultant with awesome professional advice and empathy. Thank you!